Congratulations to the winner, #227-Marie!! We recently had the chance to sample some delicious Scottish Shortbread from Kiss My Thistle. "Indulge yourself with authentic, award winning shortbread - ambrosia from Scotland. Each sensuous morsel is inspired by remembered passion and baked with love while holding to the distant memory of a special Celtic warrior near his hearth as he wrapped his lass in his plaids. This shortbread is like none you have tasted! It is decadent. Morsels of butter followed by a sweet dance in your mouth. It is time for indulgence. It is time to pamper yourself. You deserve it ! Let the rolling green hills beyond the mist embrace you as you enjoy this sinfully delicious treat. 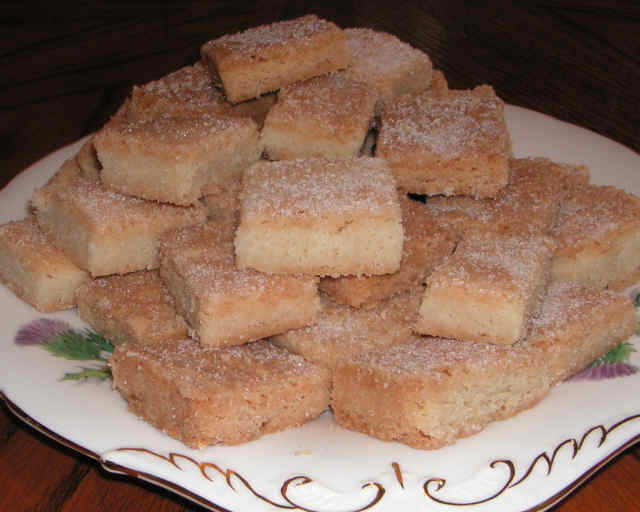 It is said that there are as many shortbread recipes as there are Scottish women. Our recipe originated in Scotland many generations ago. It is made with pure butter, flour, & sugar, infused with kilted love, then baked to a golden brown. If you are from Scotland, all you will have to do is close your eyes, take your first bite, savor the crisp buttery flavor, and you are back home without the airfare. It is that delicious! Traditional Scottish Shortbread melts in your mouth. It is not hard like factory fare. While a firm, deep texture the flavor immediately captivates your mouth and you do not need to wash it down. Calories? Just enjoy." What we thought: Wowza! The Scottish shortbread from Kiss My Thistle is absolutely divine! Seriously, like melt-in-your-mouth goodness. I'm a little bit embarrassed to say that I opened the first package of shortbread and nearly finished the whole thing myself in a matter of minutes...but just a little bit embarrassed because I guarantee, if you like shortbread you, too, will find this delicacy from Kiss My Thistle hard to put down:) Along with the original recipe, we also tried Chocolate Mint and Cranberry and both varieties were super tasty. The buttery goodness of this shortbread is hard to resist, but (in my opinion) well worth the calories:) ABCD Diaries gives Kiss My Thistle Scottish Shortbread an A+! Buy It: Find these melt-in-your-mouth delights at Kiss My Thistle. Win It: One ABCD Diaries reader will win a box of yummy Scottish Shortbread from Kiss My Thistle!! To enter, sign up to follow our blog via GFC and comment below. Disclosure: ABCD Diaries was given shortbread samples for review purposes only. We were in no other way compensated. The opinions expressed in this post are ours and ours alone. I am a gfc follower, I would love to try these. I "like" ABCD Diaries on FB! I "follow" ABCD Diaries on Twitter! I entered your Turkish Towel Giveaway. I follow your blog with google friend connect and I think this is my favorite giveaway of yours so far!! I bet this will be way yummier than Walker's shortbread that I'm used to. I follow via GFC! They sound fabulous! I'm a gfc friend and would love to try this. Mmmmm! It would go great with a cup of tea.